Hazel Greene is a highly regarded artist, known throughout Ireland and North America. Her work is popular for its bold use of colour and unusual forms of presentation. Hazel has been in business since 1994, designing and producing quality hand painted silk giftware. 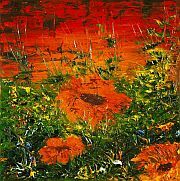 Working from her studio close to the heritage town of Birr, Co Offaly, Hazel paints landscapes and many other subjects in her own impressionist style. Her products also include an extensive choice of scarves, wall hangings and lampshades. Irish contemporary artist Emma Barone. Her work instills enlightened images with bold and sensitive colours, strokes that are affecting and suggestive. Style that is interpretative, contemporary and insistent. The intensity with how she visualises shows in her work. Emma creates original works of art on canvas & paper using oils, acrylic, chalk & oil pastel, oil bar, ink, charcoal pencil & gouache. Irene Woods is an established artist based in County Louth. She specialises in landscape painting,much of her subject matter is inspired by the beautiful scenery in Carlingford and the Cooley Peninsula where she works from her studio,and the surrounding areas North and South of the Border. As well as landscapes she paints well observed compositions of animals, mainly sheep and horses. Irene works both freelance and to commission and her paintings are now included in many public and private collections in Ireland, France, Belgium, U.K., Norway, USA and Canada.Her work has been commissioned by bodies such as International Fund for Ireland,Louth Co.Council, Dundalk U.D.C., Irish Farmers Association and Louth Leader. Clodagh Hendy paints on her own stretched canvases using a 3D aspect.Clodagh explores the themes of poppies and other exotic flowers, capturing them on canvas and as lampshades using a wide range of mediums including acrylic, metallic and built in glitter for the golds and silvers expressed throughout. Three years ago, after twenty years as an art teacher, contemporary Irish artist Maura Fahy made a decision to paint full time. She has developed a unique style working in a variety of materials, but specialising in oils. Elena has become recognised as an artist of remarkable talent. Her inspired use of the brush and palette to evoke affectionate scenes of cities and landscapes of Ireland and the world. Of particular note is her use of light to capture the varying mood of the cities. Her portraiture too is most striking. She seems to be able to capture the very essence of a person in a most extraordinary manner. 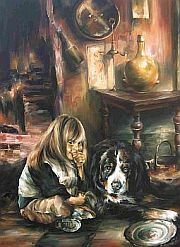 Her paintings of children are just captivating and one almost expects them to walk out of the canvas.